A new Plant Health Order is set to tackle the outbreak of Phytophthora ramorum on larch trees in south west Scotland. The Plant Health (Forestry) (Phytophthora ramorum Management Zone) (Scotland) Order will focus on administering the movement of infected materials in particular. It applies to an area called the ‘Management Zone’ where high levels of infection are already widespread. 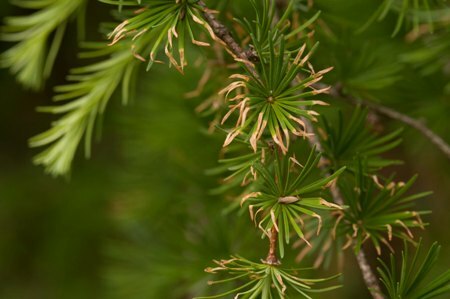 The new Order has been issued because the approach of issuing individual Statutory Plant Health Notices and Movement Licences to owners of infected larch trees has been deemed no longer practical in the face if potential wide spread of the disease from this area. It will enable Forestry Commission Scotland to ease controls on the movement of larch materials which stay entirely within the Zone, this providing a significant easing of the current burden on many local growers and processors.It promotes an approved facility and better record-keeping in relation to the transporation of potentially infected material from the Managment Zone to other parts of Scotland and the rest of Great Britain. Forestry stakeholders have been consulted through the Phytophthora Working Group, but anyone wanting more details of the products affected, a copy of the Order, and the application form for anyone seeking a movement licence are available on the Forestry Commission Scotland website. Larch disease will be one of many tree health threats under discussion at the 2015 ICF National Conference. Booking for Tree Health, Resilience and Sustainability will open late 2014.